The candy bags are full...I'm tired. We're all tired. Tomorrow should be a blast with the kids wanting to eat all the delicious candy they acquired tonight. We had a fun Halloween, but somehow in the rush of dinner, and trick-or-treating we didn't get a family picture with our costumes before it got dark. 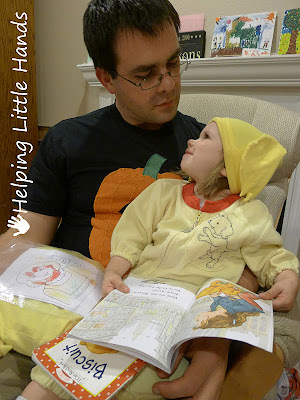 We also didn't get any pictures of Little Brother or Sweet Pea in their costumes until we were reading bedtime stories, so we'll have to get some better ones tomorrow. The living room looks like a T-shirt store exploded in it. The kitchen needs cleaning, and the whole house needs organizing. A week ago, the only costume I had planned was my own, and I had no idea what we were doing for the kids' costumes, so I'm feeling pretty proud of myself with how everything came together. 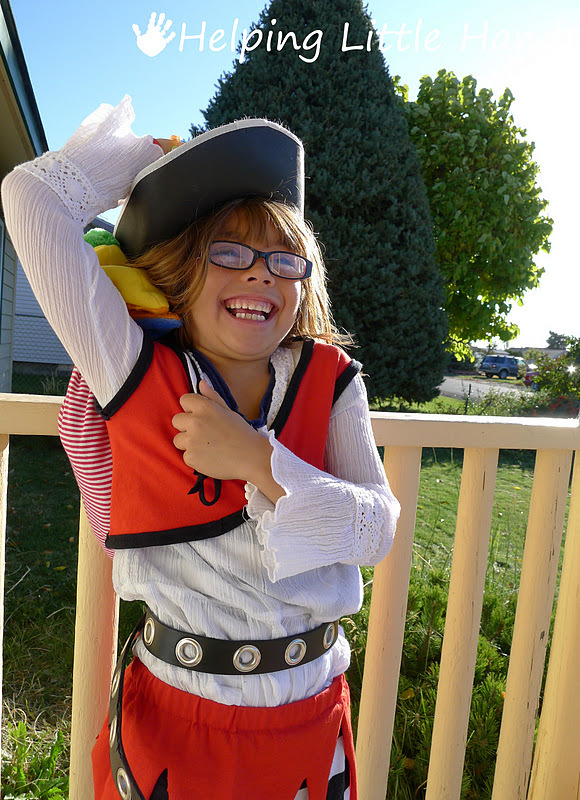 Firecracker chose to be a pirate. 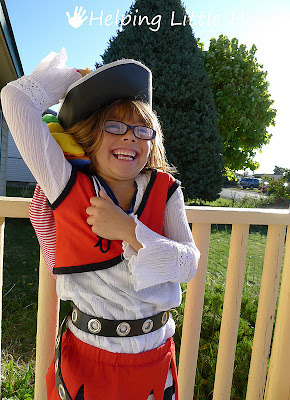 The idea first came because of the eye patch she has to wear in the afternoons...but when the time came, she insisted that she be a pirate without an eye patch. When we first talked about her being a pirate, I'd envisioned her wearing a pirate themed T-shirt dress I made her a while ago (and still need to post about). 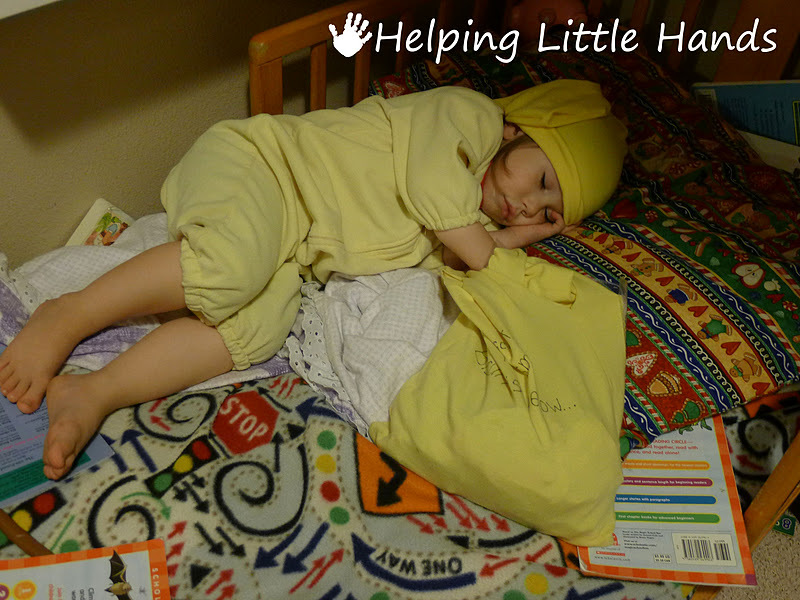 She didn't want to wear the dress though because it was normal clothes, and she wanted a costume. 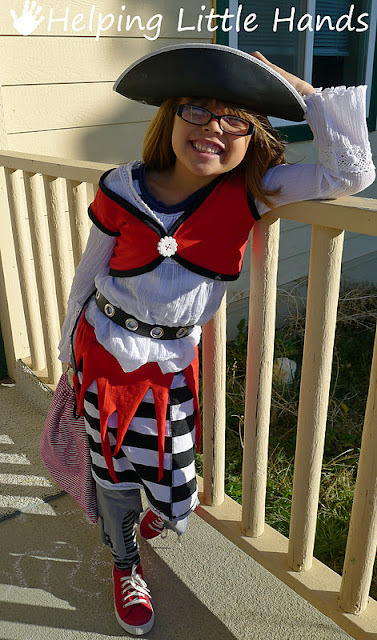 So about 6 upcycled T-shirts/pants later + some hand-me-downs and 1 dollar store hat, here's our girly tattered pirate. It was actually pretty easy, but the details deserve their own post sometime. 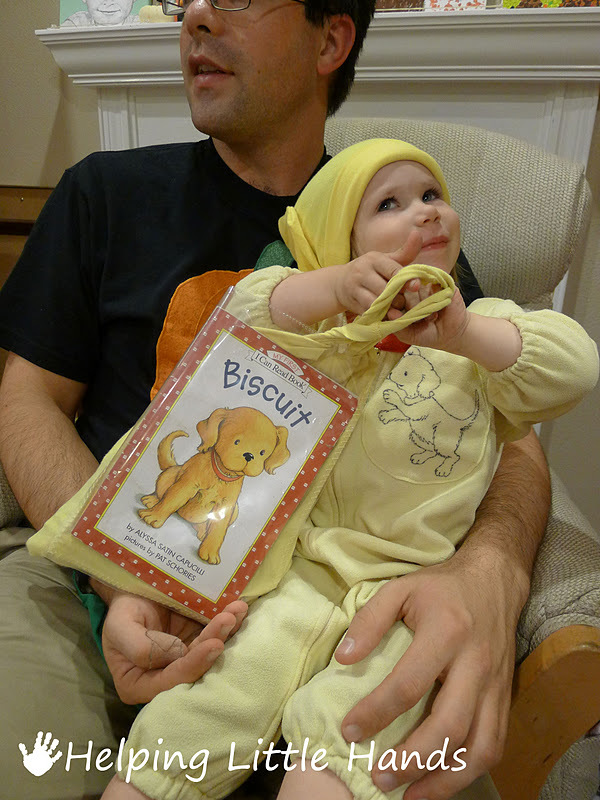 Hubby suggested to Sweet Pea, that she dress up as Biscuit the dog, since we all know how much she loves Biscuit. 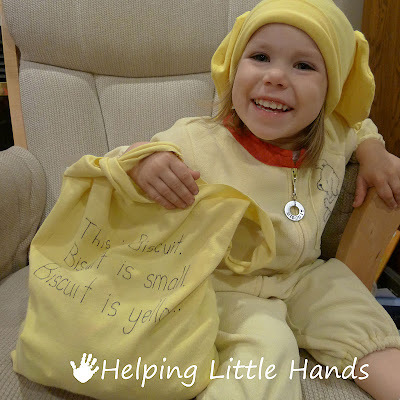 She latched onto the idea immediately and wouldn't forget about it, even though I had no idea how to pull together a Biscuit costume. 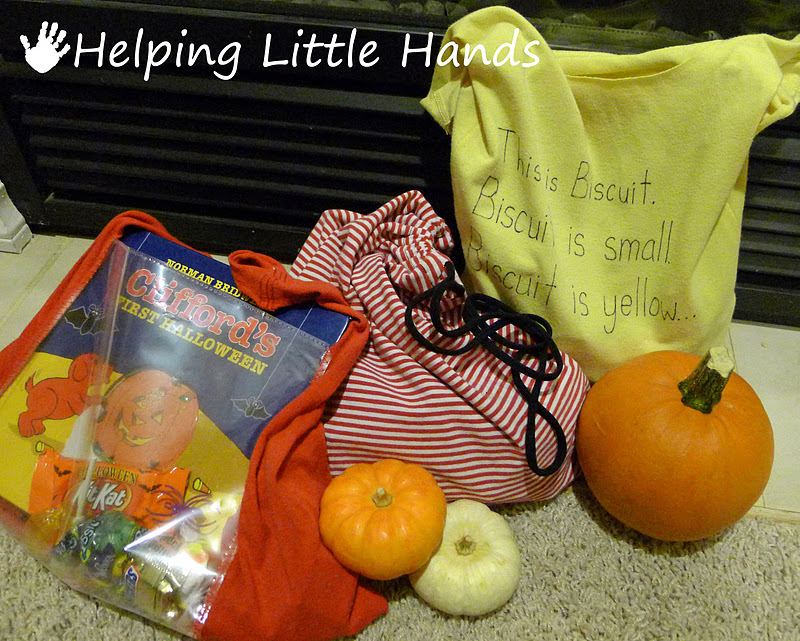 (I told Hubby later, "You NEVER suggest a costume if you don't have an idea of how to find it...) Luckily I was able to find some old foot pajamas of Firecrackers and remade them into a Biscuit costume (along with help from three old T-shirts). Complete with cute tail that you can't see in these pictures. 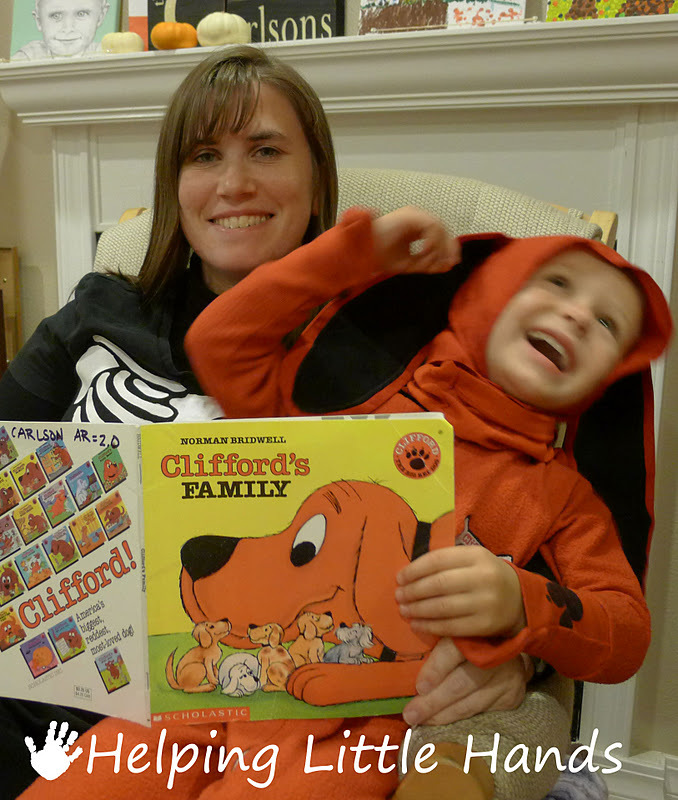 Little Brother made things easy on me by being Clifford the Big Red Dog...which was easy since we already had the costume. He added his own touch by pulling a red T-shirt sleeve over his head and wearing it around his neck. The sleeve was left over from the T-shirt butchering that went into making the costumes, and it probably kept his neck warmer. And as an after thought, I made the kids these coordinating treat bags today. (I hate those pumpkin buckets...you use them once a year and they take up so much space.) Little Brother got a red bag with a pocket for a Clifford book. Firecracker got a stripy drawstring bag, and Sweet Pea got a yellow Biscuit bag with a pocket for a Biscuit book and the first three lines of the original Biscuit books written on the back. Sweet Pea was super excited about her costume, but she might have been even more excited about her Biscuit bag. We thought having the book in there would help people know who she was. It didn't. People aren't very familiar with Biscuit unless they happen to own the books, and there's nothing really distinguishing in how he looks, like some other characters. But even if Biscuit wasn't recognized, Sweet Pea was supremely happy with her costume and went to sleep a very tired and happy puppy. I don't think tonight is the last time she'll be wearing this costume to bed. She insisted on taking her Biscuit bag to bed with her...which we figured was safe since she can't open the candy by herself...yet. And if you're still reading...Anyone notice a little surprise hidden in this post? As always, costumes are very well done. Just love your shirt! Yay for Polly! 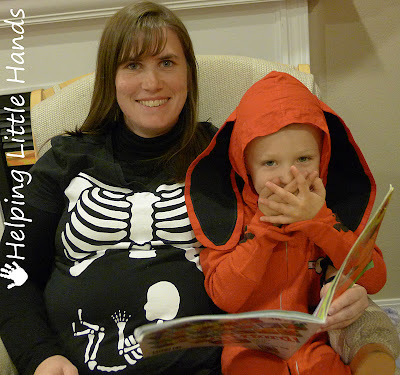 I didn't know about the bun in the oven! Congrats Polly... how fun. You all look so cute!!! I'm guessing Congratulations are in order! Loved your shirt! Your pirate was adorable and buiscut and Clifford are as cute as can be! Seriously great costumes! I love the matching bags too!